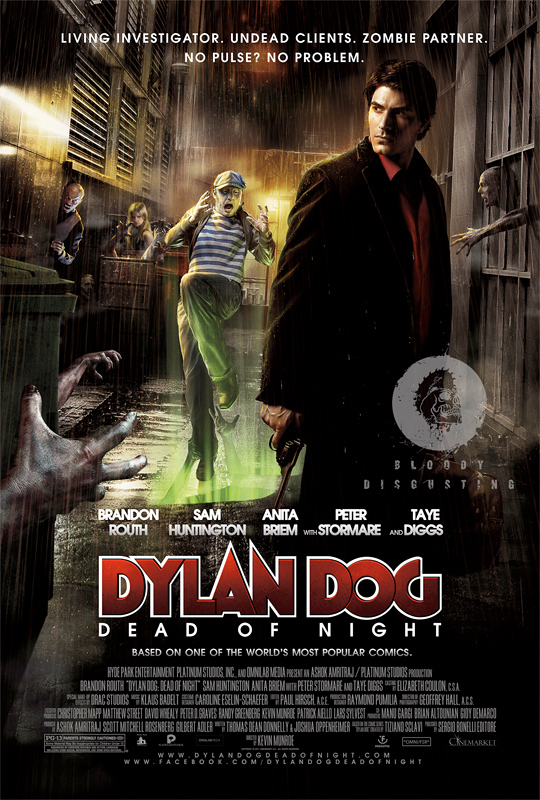 Okay okay I know it's pretty much a crime to even mention Brandon Routh's Dylan Dog: Dead of Night again, but I actually really like this new poster for it, for a couple of reasons. Bloody-Disgusting just posted the "official" poster for Dylan Dog and it has a very classic, comic book kind of cheesy, but intriguing, look to it. All the stuff going on in the background, like the guy being grabbed and pulled down by some demons coming from a glowing green sewer (or hell, whatever works), and random hands coming from everywhere. If the trailer didn't look so unbelievably awful, I might actually want to see this. Check out the poster below. If you do want to see this full-size, just click on over to B-D. And please don't watch it, but here's the trailer. Adventures of supernatural private eye Dylan Dog (Brandon Routh) who seeks out monsters (werewolves, vampires, zombies) in the Louisiana bayou while wearing his signature red shirt, black jacket, blue jeans. Dylan Dog: Dead of Night (as it's currently titled) is directed by Canadian filmmaker Kevin Munroe, who's feature debuted was the animated TMNT, but this is his first live-action flick. The script was co-written by writers Thomas Dean Donnelly & Joshua Oppenheimer (of Thoughtcrimes, Sahara, A Sound of Thunder). It's based on Tiziano Sclavi's Italian comic book series first published in 1986 (and re-released in the US by Dark Horse). Omni Lab is bringing Dylan Dog to theaters starting on April 29th this spring. Thoughts? "All the stuff going on in the background" ??? Besides that dude being reached for, which isn't going on in the background, there's nothing happening in this poster at all. Yea, nothing... nothing at all. Especially compared to this poster: http://trailers.apple.com/trailers/independent/dylandogdeadofthenight/images/poster-xlarge.jpg Yea, there's nothing happening on this one. Oh, except for all the stuff happening in the background, but nothing else is happening. I like it. It looks like the front page of a cheesy comic book. Fitting, imo. Lol your sarcasm makes no sense. Please explain to me ALLL the stuff that is going on? There is nothing. The fact that there are a few more characters standing around on this poster doesn't mean that there's so much stuff going on. The way you described it, before seeing the poster itself, sounded like it was gonna be a "Where's Waldo" amount of activity. What is Buffy doing in the background? I didn't watch the trailer up until now because of how incredibly awful it was supposed to be. Well, I actually found it quite funny. It has a bit of a Shawn of the Dead/Idle Hands vibe, which are both silly movies that I really liked. It obviously doesn't take itself seriously (duh, it's a comedy), not to mention it's based on a comic book series. For what it is it seems to deliver. Looks like good fun to me, and this poster compliments the overall tone of the movie. I like the look of it, looks very much like a video cover from the 80's, where your attention needed to be grabbed whilst perusing the shelves. Looks like one of their covers. Too bad no one here apparently reads this comic. I love them though! Good stuff! Better than about 90% of movie posters these days.